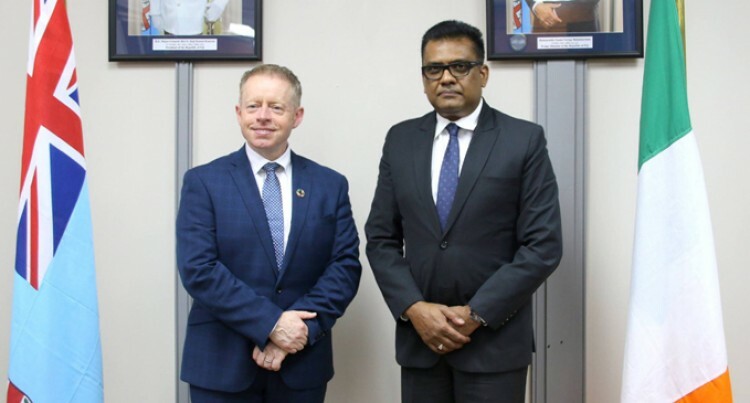 The Permanent Secretary in the Of­fice of the Prime Minister, Yogesh Karan, met the Irish Minister of State for the Diaspora and International Development, Ciarán Cannon, in Suva yester­day. Issues discussed dur­ing the meeting revolved around climate change and Fiji’s leadership at COP23, Fiji’s education strategy as well as the use of renewable energy sources. Mr Cannon said the two countries shared a com­mon ground in relation to climate change and its mitigation because it was one of the chal­lenges faced by Ireland. He commended and supported Fiji’s ef­forts in peacekeeping duties around the world and the heat they bring in the field of rugby. Mr Karan acknowl­edged the visit by Mr Cannon and the Fijian Government’s appre­ciation of the contin­uous support offered by Ireland.